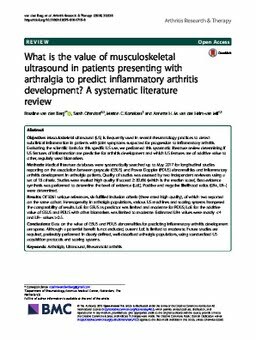 Objective: Musculoskeletal ultrasound (US) is frequently used in several rheumatology practices to detect subclinical inflammation in patients with joint symptoms suspected for progression to inflammatory arthritis. Evaluating the scientific basis for this specific US use, we performed this systematic literature review determining if US features of inflammation are predictive for arthritis development and which US features are of additive value to other, regularly used biomarkers. Methods: Medical literature databases were systematically searched up to May 2017 for longitudinal studies reporting on the association between greyscale (GSUS) and Power Doppler (PDUS) abnormalities and inflammatory arthritis development in arthralgia patients. Quality of studies was assessed by two independent reviewers using a set of 18 criteria. Studies were marked high quality if scored ≥ 80.6% (which is the median score). Best-evidence synthesis was performed to determine the level of evidence (LoE). Positive and negative likelihood ratios (LR+, LR-) were determined. Results: Of 3061 unique references, six fulfilled inclusion criteria (three rated high quality), of which two reported on the same cohort. Heterogeneity in arthralgia populations, various US machines and scoring systems hampered the comparability of results. LoE for GSUS as predictor was limited and moderate for PDUS; LoE for the additive value of GSUS and PDUS with other biomarkers was limited to moderate. Estimated LR+ values were mostly < 4 and LR- values > 0.5. Conclusions: Data on the value of GSUS and PDUS abnormalities for predicting inflammatory arthritis development are sparse. Although a potential benefit is not excluded, current LoE is limited to moderate. Future studies are required, preferably performed in clearly defined, well-described arthralgia populations, using standardized US acquisition protocols and scoring systems.